The Invitation - Blu-ray Review - ReDVDit! 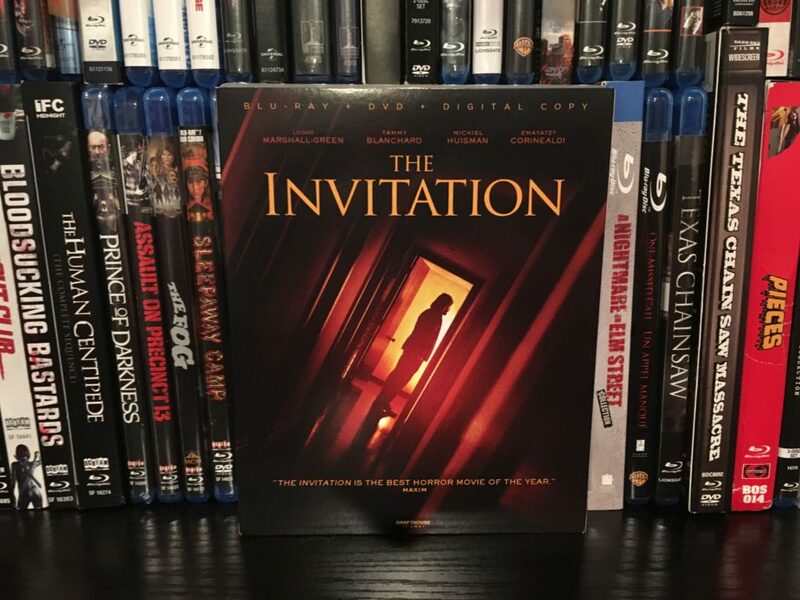 The Invitation is a low budget horror/thriller from Director Karyn Kasuma (Girlfight, Aeon Flux) and starring Logan Marshall-Green (Prometheus) as Will, who is our main narrative view into this disturbing and anxiety-inducing film. Will and his girlfriend Kira (Emayatzy Corinealdi) are invited to a dinner party by Will’s ex-wife Eden (Tammy Blanchard) at Will’s former home, now owned by Eden and her new husband David (Michael Huisman, Game of Thrones). We are told that it has been quite some time since Will and Eden had seen each other, and the dinner party is serving as a reunion between them, their new significant others, and all of their old friends. The Invitation is disturbing and unsettling right from the opening scene to the final, dramatic and stunning shot. The relationship between Will and Eden is explored throughout, with PTSD-like flashbacks transporting viewers to moments from their past and filling us in on their tragic backstory. As the events at the dinner party get stranger and stranger, we start to question whether Will is simply paranoid and struggling with the emotions of being in his old home, or if Eden, David, and their two new friends they met on their Mexico “retreat” are up to something sinister. The new friends, Sadie (Lindsay Burdge) and Pruitt (John Carroll Lynch, in a role written for him) are the perfect level of creepy. John Carroll Lynch, who you may know as the creepy clown Twisty from American Horror Story, or the possible killer from Zodiac, continues to corner the market on terrifying, sociopathic roles and does an excellent job as Pruitt. He is a real highlight of the film, and his every move left me uneasy and nervous for everyone else involved. Ultimately, it is very hard to talk about The Invitation without giving away major plot points and spoilers, but it is another film in a long line of what I believe to be a Horror Renaissance in Hollywood. As more and more sequels, reboots, remakes, and franchise movies hit the big screen, the horror genre continues to turn out some of the most original films. The Invitation will leave you anxious, nervous, uneasy, suspicious, terrified, and constantly on the edge of your seat. There is a bit of a lengthy build-up to the eventual payoff, but the acting is so well-done and the building of the environment is so essential that is not a burden on the viewer. The Invitation is not a visual masterpiece, but it’s one-location setting does not require perfect visuals. The use of lighting, camera placement, and coloring is more important to build the story and set the scene. There is a good amount of digital noise (which will look like grain) to the image during many of the darker sequences, but after initially noticing it, it did not distract from the viewing experience as the film progressed. This is simply a product of capturing a movie digitally, and although it does not look as smooth as some high-budget films, it looked fine on my screen, The use of color is actually the most important aspect to the film, in terms of the tint given to the image during particular scenes. During scenes set in the present, there is a slight reddish glow to everything, which takes on greater symbolism by the end of the film. Alternatively, in the flashback scenes, there is a heavy blue/green tint to the image. The coloring helps establish when the events take place, as they are often spliced right into the active events with little transition. Overall, The Invitation won’t win any awards for its technical visual presentation, but I had no issues with the quality, knowing that it came from a low budget thriller. If anything, the grittier feel of the film adds to the overall presentation, and perhaps even enhances it. The audio, although subtle, was the highlight of the technical presentation. Most of the film revolves around dialogue driven plot points between characters, and the audio mix was perfect for this sort of story. There was never a need to adjust the volume for dialogue, even when the film begins to pick up on the intensity in its closing act. Surprisingly, there is not a modern audio track attached to this release. In place of a DTS-HD or Dolby TrueHD track, The Invitation was released with a simple Dolby Digital 5.1 audio track. However, this was never noticeable, and I did not know that this was the case until I checked the specs after watching. The score for the film, although often appearing in short stints, is powerful. Consisting mostly of sharply played violin and piano keys at high volumes, it truly makes you feel uneasy. Horror films often use low frequency sounds in their scores to instill a sense of dread in the viewer, even lower frequencies than the human ear can hear, but we can still feel. However, the team behind The Invitation opted for these high frequency, short stinted pieces, and it truly was an excellent addition to the suspense, especially since they came with no notice and were almost effective as minor jump scares. The surround speakers are so important with this Blu-ray release, because a lot of the action happens just off-screen. With Will being our main view into the dinner party, anything that happens around him. Whether it be a knock on a door, a distant scream or laugh from the other room, or many other sound effects that I won’t mention for fear of spoilers, your surround speakers will be essential to understanding the story and allowing the environment to really crawl under your skin. My SVS Sound Prime Tower system handled these ambient effects extremely well, and I highly recommend using a full surround sound home theater system to get the best experience from The Invitation. 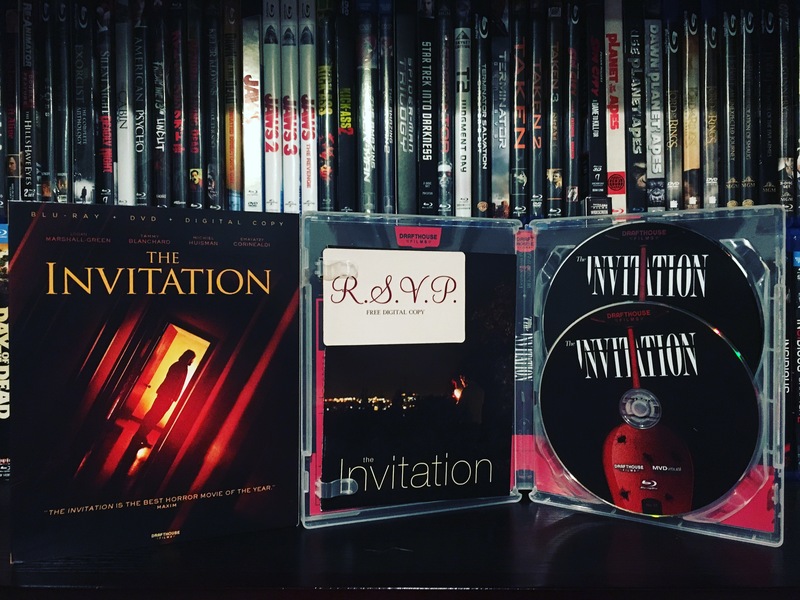 The Invitation comes to Blu-ray courtesy of Drafthouse Films and MVD Visual in a very nice package. Drafthouse collectors will know that very few releases come with a slipcover, but The Invitation does in fact have one, with some excellent, minimalistic artwork. On the inside, we are treated to a typical Drafthouse clear case, with a booklet on the film, a Blu-ray disc, a DVD, and a unique digital copy code. With Drafthouse releases, the digital copy cannot be redeemed through iTunes or UV services. Instead, you enter the code on the Drafthouse website, and download from them, giving you access to use the raw file of the film on any platform. This is a nice addition for those who don’t like to be tied to one service, and allows you to have a physical file of the film on your hard drive, rather than stored in some cloud service. The Blu-ray also comes with reversible sleeve art, with the opposite side featuring artwork from Mondo artist Alan Hayes, which is a very cool addition for collectors and fans of Mondo’s artistic team. Previously mentioned booklet – this contains essays, film stills, a Director’s Statement, and information on the Blu-ray release. After watching The Invitation multiple times and being engrossed in the character’s interactions, the environment, and the subtle hints that viewers will probably miss on a first viewing, I do believe that I have found a new favorite from 2016, and maybe the top horror movie that I have seen this year. Certainly, the slow build-up and gradually increasing tension may not be for everyone, and horror fans who enjoy more of a slasher-type film will not feel much for The Invitation. However, it appeals to a much wider audience than the typical horror movie, and as a film, regardless of its genre, it is masterfully done. To take such a basic idea as a dinner party amongst old friends, and craft so many meaningful relationships in just 100 minutes between characters which the viewer has no previous knowledge, was simply fantastic. I highly recommend grabbing this Blu-ray release, not so much for its technical prowess, but because of its care in packaging and excellent content. For Drafthouse collectors, this is a must-have, and for those who have not yet jumped into the Drafthouse catalog, this would be a excellent starting point. The Invitation can be purchased on Blu-ray via the Drafthouse website, or on Amazon.